Mouse anti Human collagen VII antibody, clone LH7.2 recognizes the carboxy-terminus of type VII collagen (Kirkham et al. 1989). Collagen VII is a basement membrane protein in stratified squamous epithelia which is involved in membrane organization through interaction with other ECM components (Gammon et al. 1992). It is composed of three identical alpha chains, each having an amino-terminal non-collagenous domain and a carboxy-terminal collagenous domain. Mouse anti Human collagen VII, clone LH7.2 has proved effective for immunohistochemical identification of basement membrane in human skin (Watson et al. 2001). Heagerty, A.H. et al. (1986) Identification of an epidermal basement membrane defect in recessive forms of dystrophic epidermolysis bullosa by LH 7:2 monoclonal antibody: use in diagnosis. Br J Dermatol. 115 (2): 125-31. Leigh, I.M. et al. (1987) LH7.2 Monoclonal antibody detects type VII collagen in the sublamina densa zone of ectodermally-derived epithelia, including skin. Kirkham, N. et al. 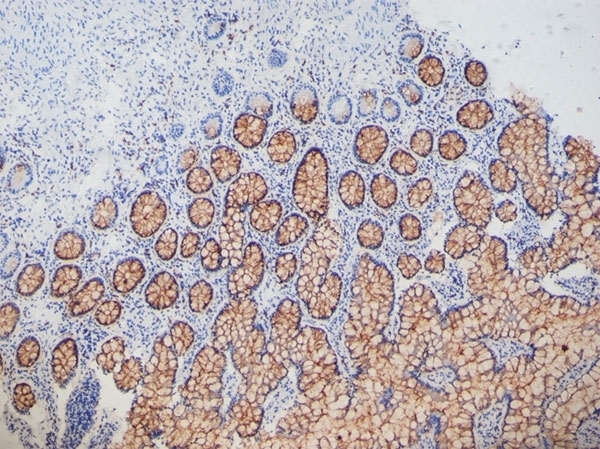 (1989) Type VII collagen antibody LH 7.2 identifies basement membrane characteristics of thin malignant melanomas. J Pathol. 157 (3): 243-7. Leigh, I.M. et al. (1988) Type VII collagen is a normal component of epidermal basement membrane, which shows altered expression in recessive dystrophic epidermolysis bullosa. J Invest Dermatol. 90 (5): 639-42. Ghohestani, R.F. et al. (1998) IgE antibodies in sera from patients with bullous pemphigoid are autoantibodies preferentially directed against the 230-kDa epidermal antigen (BP230). J Clin Immunol. 18: 202-9. Craven, N.M. et al. (1997) Clinical features of photodamaged human skin are associated with a reduction in collagen VII. Br J Dermatol. 137: 344-50. Al-Refu, K and Goodfield, M. (2011) Immunohistochemistry of ultrastructural changes in scarring lupus erythematosus. Clin Exp Dermatol. 36: 63-8. Herndon, D.N. et al. (1995) Characterization of growth hormone enhanced donor site healing in patients with large cutaneous burns. Al-Refu, K. and Goodfield, M. (2009) Basement membrane changes in lichen planopilaris. J Eur Acad Dermatol Venereol. 23: 1289-93. Watson, R.E. et al. (2001) A short-term screening protocol, using fibrillin-1 as a reporter molecule, for photoaging repair agents. J Invest Dermatol. 116: 672-8. Jolicoeur, F. et al. (2003) Basal cells of second trimester fetal breasts: immunohistochemical study of myoepithelial precursors. Pediatr Dev Pathol. 6: 398-413.